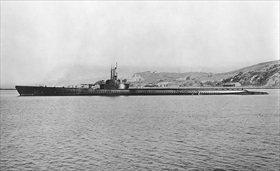 By October 1944 U.S. Navy submarine Tang and her skip­per Richard O’Kane were leg­en­dary. (O’Kane had earlier made a name for him­self aboard the Wahoo as exec­u­tive officer under Dud­ley Walker “Mush” Mor­ton.) 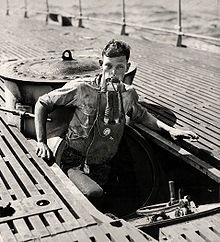 The Tang, a Balao-class sub­ma­rine, was cre­dited during the war years with sinking 31 enemy ships totaling over 230,000 tons and damaging two more for 4,200 tons; res­cuing more downed air­men; and pulling off more daring sur­face attacks with its 5‑inch/25‑caliber deck gun and two can­nons than any other Allied sub­ma­rine in the Pacific. And then on this date in 1944, while in the For­mosa Strait on her fifth patrol, tra­gedy struck when, twenty seconds after its launch, the Tang’s own Mk 18 tor­pedo boo­mer­anged, struck her in the aft tor­pedo room, and sank her in 180 ft of water. Of the nine officers and men on the bridge, three were picked up eight hours later. Five from below the hatches used a primi­tive emer­gency escape device called the Mom­sen lung to reach the sur­face and were able to remain afloat until rescued. A total of 78 men were lost. A Japa­nese destroyer picked up the sur­vi­vors the next morning. On board the destroyer were some in­jured vic­tims of the Tang’s pre­vious sinkings, who tor­tured the sub­ma­riners, kicking, rifle-butting, and burning them with ciga­rettes. The Tang crew­men were taken to the Japa­nese Navy Yoko­suka Guard Unit Ueki Detach­ment, a secret pri­son unoffi­cially known as the “Tor­ture Farm.” Along with other sub­ma­rine sur­vi­vors, Tang crew mem­bers were labeled “special” pri­soners and accused of making war on civil­ians because 90 per­cent of the crews on Japa­nese mer­chant ships were civil­ians. The men were put on half-rations. The Red Cross was not noti­fied of the cap­ture of the Tang sur­vi­vors owing to their special status. Later the sur­vi­vors were trans­ferred to a camp on Tokyo’s out­skirts, where they labored clearing away wreck­age from Allied air raids. There they remained, close to death, until their lib­er­a­tion in August 1945. O’Kane, who earned a Con­gres­sional Medal of Honor for his last two engagements, weighed only 88 pounds when freed. Left: Commander Dudley “Mush” Morton (left) speaks with his execu­tive officer, Richard O’Kane, on the bridge of the Wahoo days after tor­pe­doing the Japa­nese troop trans­port Buyo Maru, north of New Guinea, on Janu­ary 26, 1943, on the sub’s third patrol. O’Kane was the Wahoo’s execu­tive offi­cer on the first five of her seven war patrols before leaving to assume com­mand of the USS Tang. He credited much of his suc­cess as the Tang’s skip­per to the training he received serving under Morton. Right: The Momsen lung shown here during a training exer­cise was a primi­tive under­water rebreather stored aboard U.S. sub­ma­rines as emer­gency escape gear. The Mom­sen lung cleaned and recycled the user’s expelled air. The only known emer­gency use of the Mom­sen lung was during the escape from the Tang on October 25, 1944. Left: The loss of the Tang by her own tor­pedo, the last one fired on the most success­ful patrol ever made by a U.S. sub­ma­rine, was a singu­lar mis­for­tune. Twenty-two of Tang’s tor­pe­does found their mark in enemy ships, sinking 13 of them; one missed. O’Kane received the Congressional Medal of Honor for the Tang’s final action on Octo­ber 24 and 25, 1944, when the sub inter­rupted heavily loaded Japa­nese trans­ports and a tanker en route to the Philip­pines. (The recap­ture of the Philip­pines had begun with Gen. Douglas Mac­Arthur’s landing on Leyte Island on Octo­ber 20, 1944, and the naval battle of Leyte Gulf (October 23–26) was in full swing). 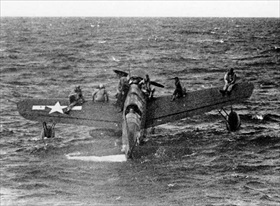 Right: Downed U.S. airmen on a Vought OS2U Kingfisher near Truk Lagoon await rescue by the USS Tang, 1944. (The OS2U was a cata­pult-launched obser­va­tion float­plane.) On her second war patrol, the Tang was assigned to life­guard duty near Truk. The Tang rescued 22 downed air­men and trans­ported them to Hawaii at the conclusion of her patrol.